Marriage is great; but it's not forever. It's until death do us part. Then come eternal rewards or regrets depending on how we spent our lives. Francis Chan joined together with his wife Lisa, address the question many couples wonder at the altar: How do I have a great marriage? 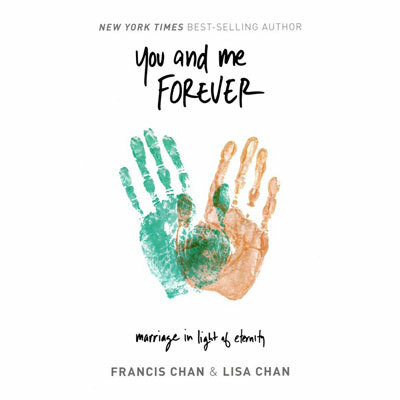 Setting aside typical topics on marriage, Francis and Lisa dive into scripture to understand what it means to have a relationship that satisfies the deepest parts of our souls. Jesus was right. We have it all backwards. The way to have a great marriage is by not focusing on marriage. Whether you are single, dating or married. You and Me Forever will help you discover the adventure that you were made for and learn how to thrive in it. Francis Chan Francis Chan is the best-selling author of Crazy Love, Forgotten God, Erasing Hell, You and Me Forever and the host of the BASIC.series (Who Is God & We Are Church). Currently, Francis is planting churches in the San Francisco area and recently launched a countrywide discipleship movement called Multiply with David Platt. Together, Francis and his wife Lisa raise their five children in Northern California.